GrayBunny GB-6835B Hand Forged Straight Hook, 6 Inch, Black, 2-Pack, For Bird Feeders, Planters, Lanterns, Wind Chimes, As Wall Brackets and More! Add A Touch of Elegance to Your Home or Garden! - Beautify your home or garden by hanging planters, flower pots, bird feeders, lanterns, holiday decorations, wind chimes, ornaments and more! - A classic and timeless look that effectively embellishes your home or garden. - Extends 6 inches from the wall. - Premium quality metal that is rust resistant and durable provides for a long lasting product, whether used indoors or outdoors. - Curved tip helps securely hold items while adding to the exquisite look. Click the "Add to Cart" button on top to accessorize your home or garden now! PREMIUM QUALITY: Rust resistant, heavy duty steel construction. Bring your heaviest pots and baskets! GUARANTEE: GrayBunny offers premium products for your lawn and garden while exceeding highest industry standards and offering impeccable customer care. With a lifetime guarantee, if you'd like your money back at any time, just ask. Click the "Add to cart" button to adorn your home or garden now! 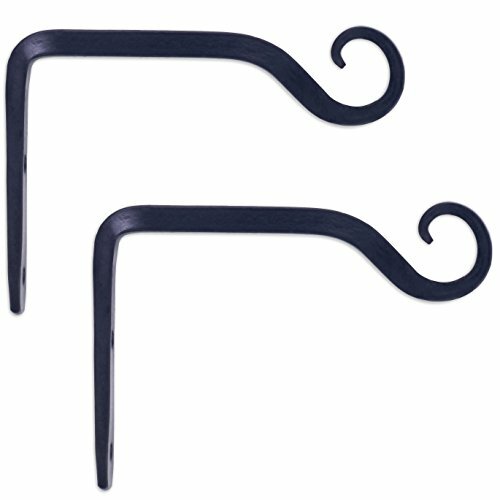 GrayBunny GB-6838B Hand Forged Curved Hook, 8.5 Inch, Black, 2-Pack, For Bird Feeders, Planters, Lanterns, Wind Chimes, As Wall Brackets and More! GrayBunny GB-6819V Heavy Duty Deck Hook, 37 Inch Pole, 2 Inch Non-Slip Vertical Clamp, With 360 Degree Swivel, For Bird Feeders, Birdhouses, Planters, Suet Baskets, Lanterns, Wind Chimes & More!